RICHMOND, B.C. - Fourteen people who were rescued from a boat that hit a rock wall in the Fraser River in Richmond, B.C., were in training to save others in a similar situation. John Horton, captain of the search and rescue vessel that belongs to the Canadian Lifeboat Institution, said high winds and heavy rain swept the boat sideways and slammed it onto the rocks on Thursday night. Horton said five people were rescued by another boat that belongs to the group while nine others were plucked to safety by members of the Royal Canadian Marine Search and Rescue and the Canadian Coast Guard. He said everyone was taken off the Steveston Lifeboat about 45 minutes after it hit the wall but the vessel was not in jeopardy of sinking though half of it is now sitting underwater. Royal Canadian Marine Search and Rescue spokesman Rob Duffus said the trainees were shaken up but not hurt. The Transportation Safety Board said its investigators have been deployed to look into the marine accident involving the vessel registered as Artist Life. 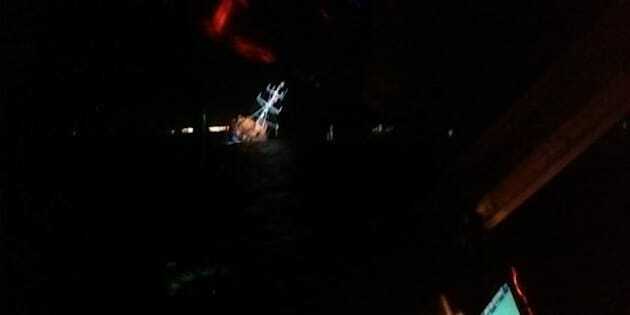 The Joint Rescue Coordination Centre said the coast guard is monitoring the boat until it can be salvaged.